A wise man once told me, “Becareful of your actions while at work, it’s like being in a fishbowl and everyone is watching what you do.” This man was my boss for many years and his statement came after I had to be talked to because a customer had complained about how I had reacted to something that had happened in the restaurant. From that day forward I began to be more aware of my surroundings and tried to control what came out of my mouth and the actions I made. It just did not seem to occur to me that someone would actually be watching what I was doing while I served burgers and fries, however, once this was pointed out, I started seeing how much I “watched” people when I was out and about. How often was I making judgement calls against persons I did not ever know? Was I over critical of persons I came in contact with even if I had no idea why they were acting this way? Sure gave me something to think about. We all know the old saying, “Can’t judge a book by its’ cover” yet we do this with people all the time. We assume things about people just by what they are wearing or the language they are speaking. We sometimes can’t even see past the outer appearance into who they really are in the outside because we fail to remove the stigmatization that comes with the dress code. Take for instance a group of teens hanging out at the mall, they all are swearing and making remarks about people. What do we do? We make a blanket judgement, shake our heads and move on. What we fail to see is the one in the group who is acting just like the other teens because they want to fit in. When they are not with this particular group, they do not swear or smoke or act out in public, they read their Bible, volunteer their time and go to church. Often times it is our surroundings which make us act the way we do. Fair statement? Something which I have been working on in my lifestyle is to be more accepting of others in my life. I really have been trying to get it permanently ingrained in my brain that God loves us all equally. He loves the pastor, the drug addict, the co-worker, the teens…..He loves them all equally. I know it is difficult to wrap our minds around, however it is not for us to even questions….it is true, He is an equal respecter of persons, and if we claim to be Christian then we need to have the same mindset. We need to accept those who may not get the job like we do or play as well at a certain sport. We were all created differently with a multitude of talents and skills. Yet, God, our Father, loves us just the way we are, no matter what. I don’t think this world will ever get the full picture of what God sees in each individual and it would be foolish of us to work towards converting everyone, however if we took one little step towards kindness to everyone in our own lives, we could at least affect the “waters” around us. Now, we cannot choose the fishbowl we end up in, however, we can choose how we will react in our little environment. Do we want to live in still waters or choppy seas? 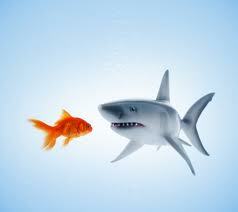 Do we want to become like the shark so that others avoid us or do we want to be like the docile gold fish? We get to choose how we react in each moment of our lives and unless you are living in your own fishbowl, all alone, others are watching. They are waiting to see if you are a true Christian or acting the part. 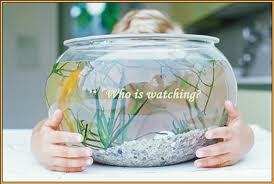 When we become labeled “Jesus Fish” we are watched so much closer than the other fish in the bowl. People expect us to react differently than others in certain situations and if we react incorrectly they want to take us out of the bowl and fry us! As Christians, we should strive to live daily like Jesus would. He showed kindness wherever He went. He was not judgmental. He was honest in all situations. And if anyone felt like they were in a fishbowl, I am sure Jesus felt that feeling from time to time. All eyes were on every move He made. People were waiting for a mistake to be made. They wanted to point fingers and tap on the bowl. Jesus just did not give them the opportunity to do so, He just kept doing what the Father instructed. What if we just kept doing what the Father instructed? What if we did not concern ourselves with watching and judging others but rather focused on being like Jesus? Could we make a cleaner fishbowl so to speak? Could we keep the waters calm? Yes, it takes strength and endurance to swim this race, but it is so worth it in the end. What can you do today to make your fishbowl a little better? Is there something you could say or do that calm the waters where you are? I know for me I need to work on accepting others for who they are and learning not to overreact in situations where I get easily frustrated. I need to learn not to react when someone is tapping on my bowl. I want not to be the shark, I’d rather be a goldfish. I want to be a person who people watch because it’s something they like to see, not watch for the negativity I spread. 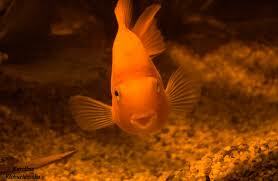 I want the world to see Jesus while I am swimming around in my fishbowl everyday. Yes, I want to be accepted by others, we all do, however I want it to be for my integrity not my willingness to fit it. I want to swim in harmony with my fellow fish, leaving happiness in the wakes we leave behind us. Previous PostBreaking DarknessNext PostSome Peoples’ Children! Amen! Such a good word!! God bless you!!! Thanks, be blessed as well! !